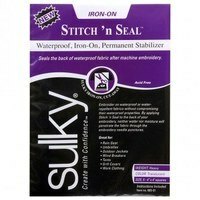 Sulky Stitch'n Seal allows you to reseal waterproof materials after embroidering them. Seal needles penetrations by ironing Stitch'n Seal onto the back side of your project over the stitches. No more dripping umbrellas or leaking raincoats!